We've written previously about cool web-based resources here at ExhibiTricks that help explicate information about the human body, but I recently came across a website with a slightly more focused approach. The Science Museum in London has created a site called "Brought To Life" that aims to provide resources and activities concerning the history of medicine. 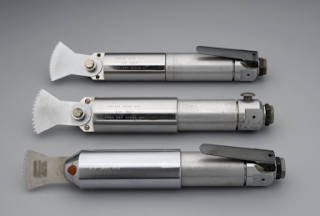 Drawing upon the Science Museum's vast collections and educational expertise, the Brought To Life site includes great information about a range of medical-related topics including hospitals, epidemics, and my personal favorite --- the history of surgery and surgeon's tools. Naturally there's enough multimedia fun to keep kids busy, as well as a great many photographs of collection objects and in-depth explanation of medical topics that will be of use to students and teachers. All in all, Brought To Life is a great website to check out and add to your bookmarks. Who knows the next time you might have to gather some information about bone saws?